In a roundtable discussion with UCLA students and Chicago entrepreneurs at Startup UCLA on Feb. 12, Chicago Mayor Rahm Emanuel was adamant that despite all his career accomplishments, it is his failures, not his successes, that continue to teach him his biggest lessons. For the students in the room, it was exactly what they needed to hear. Emanuel served in the White House during the Obama and Clinton administrations as chief of staff and senior a dvisor to the president for policy and strategy, respectively, and was a three-term U.S. Representative for Illinois’s 5th congressional district. He has served as mayor of the city of Chicago since 2011. The roundtable was part of Emanuel’s daylong visit to UCLA, which included delivering the keynote address for the 2018 UCLA College Luskin Lecture for Thought Leadership at UCLA Royce Hall. 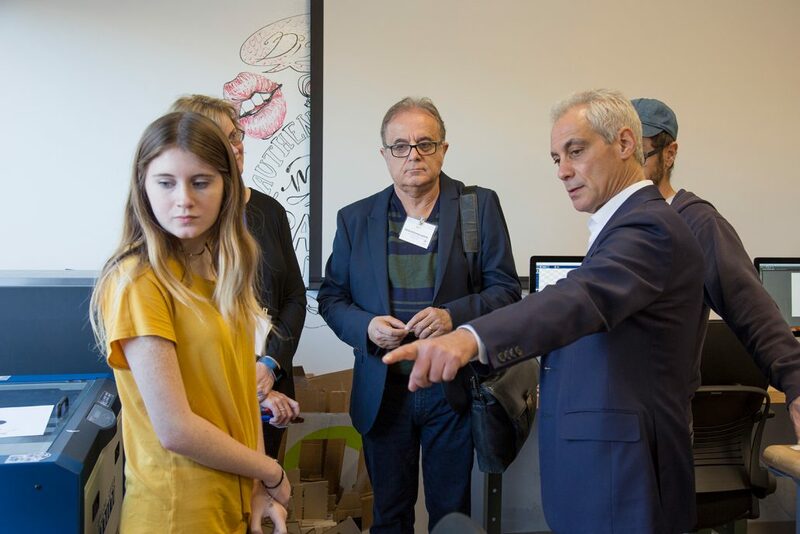 Mayor Emanuel visited students in the Maker Space to hear more about their opportunities to experiment with new technologies. In the afternoon before the lecture, Emanuel visited Startup UCLA with a delegation of Chicago-based technology leaders as part of the Think Chicago Roadshow, Emanuel’s and World Business Chicago’s initiative to visit universities across the country to attract the next generation of tech leaders to the city. The group toured the Maker Space in Rieber Hall, where students can use 3D printers, laser cutters, software and other tools to create their own projects, and had a peek at the Design & Innovation Living Learning Community in Sproul Hall, which cultivates students’ passions and pursuits around technology, innovation and the entrepreneurial spirit. Emanuel and the entrepreneurs then sat down with seven undergraduate and two graduate students who had been invited because of their various interests in entrepreneurship. 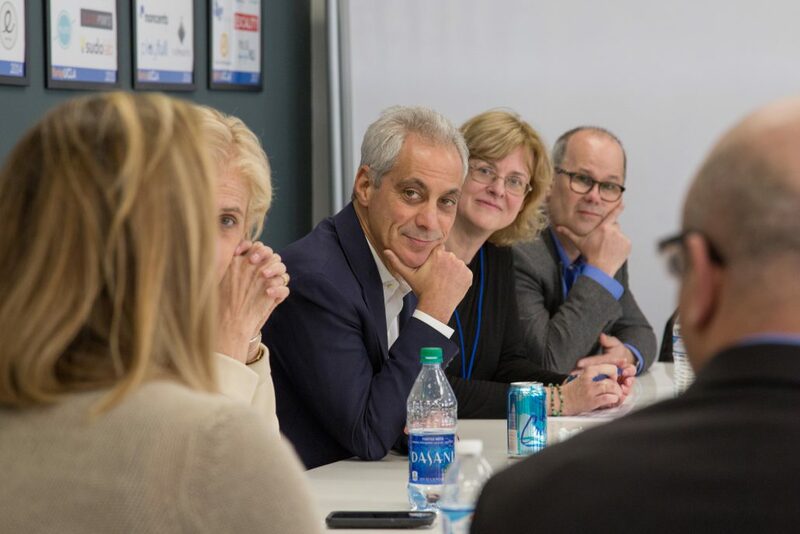 Emanuel discussed efforts to foster a culture of innovation and business leadership in Chicago, and he and the delegation shared their advice for finding success in the entrepreneurial world. Emanuel shared his vision for Chicago as a city that welcomes and supports business leaders and innovators of all kinds, not just major corporations. He outlined the initiatives he has implemented in order to position Chicago as a hub of innovation, education and business, demonstrating that public policy and entrepreneurship can complement each other and allow both companies and communities to thrive together. Second-year mechanical engineering major Nikhil Pawar noted that while he has met several technology leaders before, this was the first time he’d had the chance to hear directly from a leader in public service. “Hearing about the social space, which is something I’m trying to marry into my work, was incredibly useful,” Pawar said. Anshul Aggarwal, a third-year computer science major, asked Emanuel for his advice on risk management: How does he determine whether an investment of time, money, energy or resources is worthwhile? Chicago business and innovation leaders joined the mayor to share key career insights with students. Aggarwal said Emanuel’s insights would stay with him for a long time since he sometimes struggles to decide whether a new project is worth taking on. But Emanuel struck the biggest nerve when he encouraged the students not to be afraid to try something new and to embrace failures as necessary for success. He pointed to two low points in his life—when he nearly died as a teenager and when he was briefly fired from the Clinton administration—as the events that taught him more about his capabilities than any other achievement in his life. Frances Lai, a third-year cognitive sciences major, said Emanuel’s words reassured her that she’s still young and has a lot of time to do something with her life. Having the opportunity to meet Emanuel and listen to his insights in such an intimate setting “means the world,” Aggarwal said. Startup UCLA Executive Director Deanna Evans hopes the students will be inspired by the once-in-a-lifetime experience of participating in a roundtable with Emanuel and the Chicago entrepreneurs. The Cherry Award honors outstanding professors who are extraordinary, inspiring teachers with a positive, long-lasting effect on students and a record of distinguished scholarship. Priority enrollment for summer 2018 opened on February 1, which means that students like Arpi Beshlikyan are already deciding whether to catch up, get ahead or explore future careers. “I plan on taking two prerequisite courses this summer, Physics 4BL and Computer Science 180,” said Beshlikyan, a second-year computer science and engineering major. Her goal is to have more room in her schedule during the regular academic year to take interesting electives. She’ll join more than 12,000 other UCLA students who choose to enroll each summer. With 1,000+ new and popular courses as well as intensive summer institutes, UCLA Summer Sessions provides opportunities for incoming, current and visiting students to fulfill graduation requirements, take courses outside their majors and prepare for life after graduation. Beshlikyan pointed out that since there is no unit minimum during Summer Sessions, she can take only those two courses, allowing her to focus without splitting her time between other courses plus extracurricular activities. With the campus population at less than half its normal size, Beshlikyan looks forward to enjoying the summer weather and less crowded campus. For students who may not be in Los Angeles over the summer, select academic courses are offered online. Kya Williamson, a fourth-year art major and African American studies minor, took History 10A online during Summer Sessions after her second year. While her mom urged her to take a course so she’d have something to do over the summer, Williamson was excited for the opportunity to learn about the history of American slavery from renowned scholar Robin Kelley, Distinguished Professor and holder of the Gary B. Nash Endowed Chair in U.S. History. Online courses allow students to complete the readings and assignments in their own time and some discussion sections are conducted via webcam, encouraging all students to be accountable and engaged in the course. “As long as you stay on top of your work, [online courses] are a great way to get credits,” Williamson said. Non-resident supplemental tuition is not assessed over the summer, making summer the most affordable time of year for non-California residents to take courses at UCLA. Students can also flex their creativity and explore future career options through UCLA Summer Institutes, which last from four to eight weeks and attract students from the top universities in the country as well as international students. Taught by UCLA faculty with topics ranging from architecture to management, these intensive programs allow students to immerse themselves in a field they’re interested in or try out an area of study they’re considering. 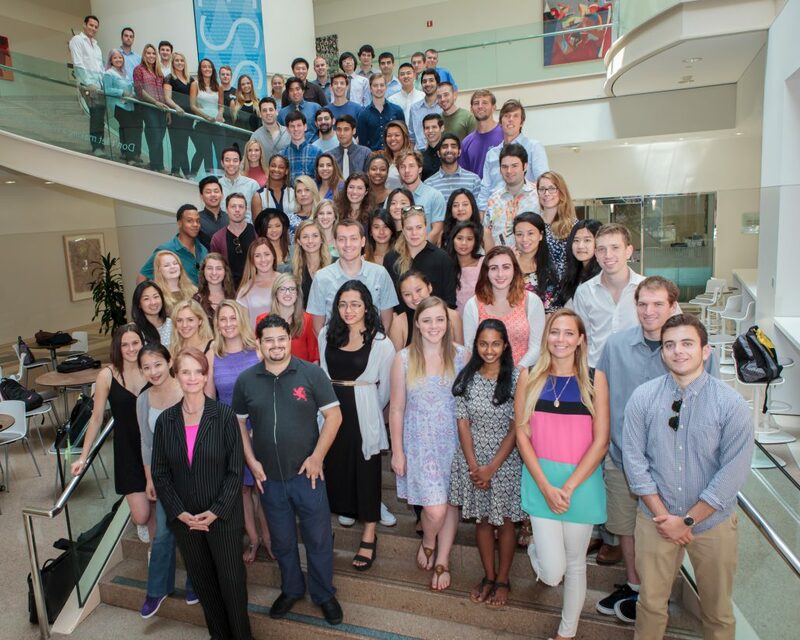 Carlie Heuple, a third-year communications and psychology double major, participated in the 2017 Managing Enterprise in Media, Entertainment and Sports (MEMES) Summer Institute offered by the UCLA Anderson School of Management, which introduces students to entertainment and sports marketing and management. Registration for summer academic courses is now open for UCLA students. Registration for visiting students opens February 15. Registration for Summer Institutes opens February 15. The Summer Opportunities Fair is on February 13. More information on summer 2018 courses and programs is available on the UCLA Summer Sessions website. Named “La’gad,” the 185-gram meteorite eventually made its way to the Earth, landing in North Africa’s western Sahara Desert; it was recovered in 2015.